Comment: A star for star-lovers. 'Steal blue', 'storm blue', 'cold sky-blue' are fitting descriptions for its hue. Well shaped, near-round high dome cabochon with absolutely no wasted bottom weight, in fact, the stone is higher than it is wide. CGJ (GIA Alumni network in Colombo) certified unheated. 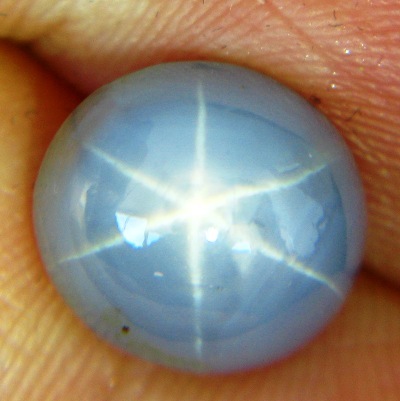 NOT opaque but translucent with the rays reaching well into the stone (read 'judging stars on photo' for more insight). 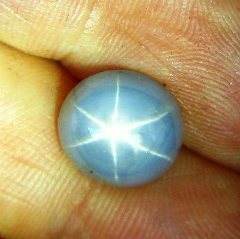 Fully coloured asterism corundum is as expensive as facetted gems (but much rarer), plus you pay extra for a good star. In this 8.61 you get a super-duper star in a good-enough blue and therefore stay under 1.5k/carat. We had a 4ct kashmir blue star once that sold for 9k/carat (and that was five years ago). Probably better suitable for a gent's ring but who knows? It will need at minimum a size 8 ring or a pendant. For the collector: This is an extra fine star. Remember, if you can see a star well on photo, it is extra good in person (unless it was photo-shopped on it of course). Study also the extra-images in diffused light (no star visible) and the see-through image to gauge how the gem looks without single light source and judge its relative transparency. One single inclusion on the outer edge.